is a revolutionary new platform dedicated to excellence and saving schools and students thousands of dollars per year. VA provides 24/7 online access to cutting edge, high quality video singing lessons and feedback. Live vocal workshops are also delivered throughout the year nationally to consolidate progress. VA online singing lessons are designed to either stand alone, or become a complementary tool for any singing program already in place.? VA is an ‘unlimited pocket mentor’: the perfect tool to enable students to learn and practice, as the lessons are accessible from their own personal iPhone, tablet, laptop or desktop once connected to the internet. VA is the brainchild of Laura Hamilton and Tim Smith, both highly qualified music theatre professionals with 25 years experience, renowned in our industry nationally and internationally. 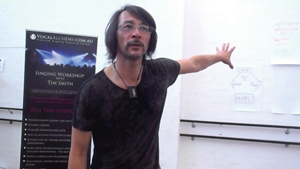 In fact the Vocal Alchemy method was developed by Tim Smith, who is the only singing teacher in Australia who sits alongside international creative decision makers, on audition panels for major musical productions – he knows what they want first hand and what singers need to learn to succeed professionally. VocalAlchemy.com.au enables users to access a guided singing lesson every day, go back over previous concepts as required, all in privacy and at their own pace. Compared with traditional lessons the cost has been massively reduced and ease of access has increased significantly. Not to mention the quality of learning from a renowned Master Vocal Coach who has dedicated 20 years to the cutting edge techniques included in the 32 video lessons. All of the singing lessons at VOCAL ALCHEMY are the result of my life as a singer, a student, and as a professional vocal teacher, vocal coach, university professor, musical director and conductor of professional musicals. Throughout my journey I have realised that singers sing and perform in an artistic expressive world, that is often far beyond the scope and understanding of traditional singing teaching and learning. The singing lessons at VOCAL ALCHEMY address this gap. After working with probably thousands of singers during a professional life of some thirty years I have learnt that the act of singing is deeply personal and artistic, enormously technical and for many people a source of frustration and mystery. I have spent much of my life finding answers and solutions to these frustrations for singers. The VOCAL ALCHEMY method ranges from essential deep self-awareness techniques to specific vocal technical skills that the elite professional singer needs today. All of the processes taught at VOCAL ALCHEMY have been developed, practiced and refined over years of teaching exploration and informed by the most current vocal research. Some vocal methods are classically based, some more contemporary, but most are superficial and lock you into specific vocal styles; VOCAL ALCHEMY addresses each of these weaknesses and covers it all! VOCAL ALCHEMY will give you an understanding of your voice and the ability to sing in multiple styles at the professional level. The VOCAL ALCHEMY method trains you to be the complete vocalist! VA has also been designed for teachers who value the vocal success of their students. As a teaching partner, Vocal Alchemy assists students to achieve accelerated vocal improvement. Students can study the Vocal Alchemy method at home then come into private or group singing lessons to ‘show and tell’ and tweak and polish their new skills. VA is the flipped classroom: hone the technical foundation at home and use class time to further enhance specific performance style. Leading perfoming arts organisations: VPAC (NSW) and PSA (VIC) have adopted the Vocal Alchemy teaching tool into their full time curriculums and have found this method to be extremely successful already. Check out the video interview to the right with David Wisken, Musical Director of Patrick Studios Australia, who describes their implementation and success with the Vocal Alchemy Method for their full time students. And the audio podcast below where business mentor Clint Salter interviews Tim.